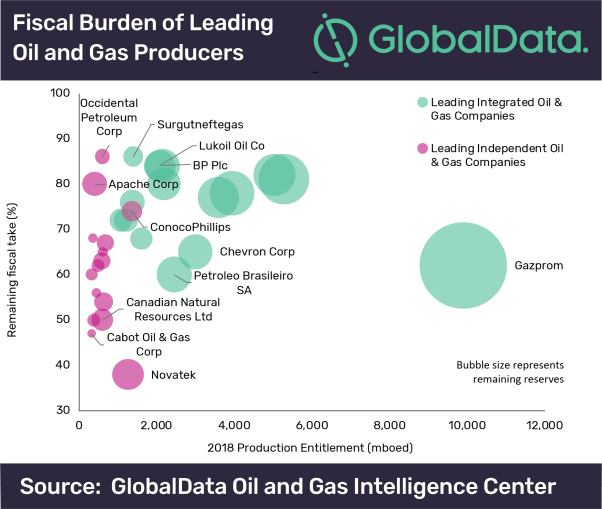 Significant incentives mean that Russia’s major gas producers, Gazprom and Novatek, are better positioned than many of their peers in terms of their future tax burden, according to GlobalData, a leading data and analytics company. The company’s latest thematic research report: ‘Taxation in Oil and Gas’ reveals a high degree of variation in the upstream fiscal regimes and tax burdens faced by leading integrated and independent oil and gas producers. Novatek faces the lowest burden among leading independents, while Gazprom places third among the top 15 integrated producers for lowest remaining fiscal take (the percentage of future field cash flows allocated to the government through royalties, production shares and other taxes). Major oil and gas taxation trends such as incentives for gas projects and intergovernmental corporate tax competition will be crucial to future value creation for oil and gas producers.